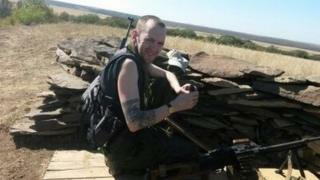 A British man who travelled to Ukraine to join anti-government fighters has been jailed. Benjamin Stimson, from Oldham, Greater Manchester, pleaded guilty to an offence under UK terrorism laws. The 41-year-old, who is the first Briton involved in the Ukrainian conflict to have faced charges, travelled out in 2015 to join pro-Russian rebels. He was jailed for five years and four months at Manchester Crown Court. Stimson, who went to the conflict zone in the Donbass region, admitted intending to commit acts of terrorism and engaging in their preparation. His father Martin said: "We are surprised by the sentence. It is too severe. "I wish my son never went there. I regret it very much. I thought he just went to work at a farm." In 2014, Russia annexed the Crimean peninsula in Ukraine, leading to a bitter conflict between the countries. Stimson - who smiled only once in court when he saw his friends and family on the balcony - left his home in August 2015 and travelled to Moscow before illegally entering eastern Ukraine. He then joined a frontline unit of the Russian-backed militia fighting against Ukrainian government forces. Stimson posted a photograph of himself on Facebook holding an AK-47 and summed up Donbass as "vodka, women and guns". But Manchester Crown Court heard that he did not actually engage in any fighting during his four months in eastern Ukraine and had intended to perform humanitarian work by driving ambulances. The judge agreed that Stimson had joined pro-Russian militia not to fight but to change the life he had in the UK. In November 2015, he returned to the UK where he was arrested on arrival at Manchester Airport. He was charged in September 2016 and remanded in custody. Benjamin Stimson's case is unusual - but it's really important because his conviction and jailing illustrates that terrorism legislation is not focused on offenders from one community who turn to violent extremism for one cause. The fighter pleaded guilty to preparing for acts of terrorism. Prosecutors have turned successfully to this offence time and again to prosecute British men who have gone to fight in Syria and Iraq - or tried to do so. Stimson's destination was of course different - but the offence was the same because of the British legal definition of terrorism. Under our law, an act of terrorism, put most briefly, means resorting to violence, or its threat, to influence a government or people for an ideological cause. Stimson's decision to support a militia attacking a legitimate government therefore fell foul of the law. And that's why he's going to prison with a terrorism legislation criminal record. Sentencing him, David Stockdale QC said: "You ultimately did no physical harm to anyone but you assisted the militia by your presence and your involvement, and you will have given a lead to others. "I accept you do not hold extremist views and you have expressed your regret for your actions." Stimson's presentation as a "fighting man" was largely "an exaggeration or even the product of fantasy", he added. Det Ch Supt Russ Jackson, head of the North West Counter-Terrorism Unit, said: "The images of him holding a rifle and wearing military clothing are deeply concerning. "He has been jailed for the role he played in a violent conflict and I hope his conviction will send a message to all those who are even considering joining conflicts."